We were so excited that we couldn’t help ourselves, so we crunched some numbers to project what states will be the strongest for residential solar growth in 2016. The data we utilized for these projections was compiled using information we receive from individuals across the United States interested in solar energy through our in-house technology. We’ve ‘scrubbed’ the data to ensure that we are taking a read on the ‘organic’ interest; in other words, non-advertising based interest. 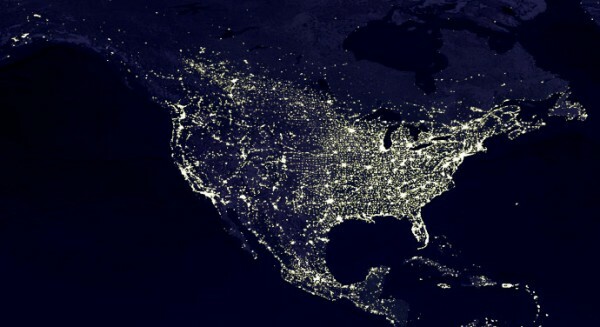 Where will the strongest solar growth happen in 2016? After crunching the numbers in these three categories we then took an overall score of the three categories to crown the top solar state among the top ten solar states to watch in 2016. The data revealed a high growth of solar energy interest across the U.S., and is full of surprises. For the strength category we evaluated the relative percentages of residential solar leads by state. This is of course heavily influenced by population – bigger states will generally have more leads as they have a higher population. So, not surprisingly, larger states such as The Sunshine, The Lone Star, and The Golden state take the top three positions as the strongest states by lead volume. 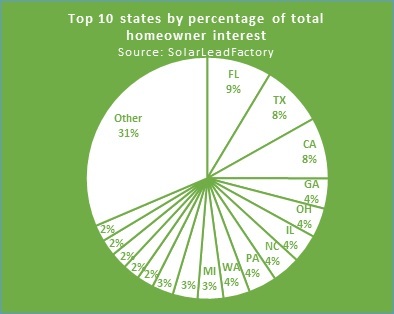 Despite state population, the data highlights that there is a general interest in solar energy across the U.S. For example, Florida, the top state had 9% of total lead volume, whereas the lowest state had .10% of the total overall lead volume. The difference between the weakest and strongest state is less than 8.9%, despite differences in state population, highlighting that people across the U.S. share an interest solar energy. And interested they are – according to research conducted by SEIA, a new solar project was installed every 2 minutes in 2015! In last year’s report, we predicted that “with the right long-term strategies in place Texas and Florida would become the major markets for solar in 2015”. And they have. Florida and Texas have claimed the top spots in strength this year, bumping California – last year’s winner – to the third spot as the state with the strongest interest in solar in the USA. The ‘passion’ category was used to measure a state’s demand for solar irrelative of the state’s population when compared to other states. This category shows the raw interest that residents in each state have for solar energy. The passion ranking is calculated as % of interested residents per state divided by % of the state’s population relative to total US population. This neutralizes the impact of that state’s population in the rankings. Simply stated, the greater the value in the chart, the higher the concentration of people who want solar in the state. The “1” indicates an equal percentage of people that want solar in the listed state (e.g. (10% of the total leads) / (10% of the US population in that state) = 1). There is a state hierarchy of interest in solar energy across the U.S., however, this does not detract from the nationwide interest in solar. Residential solar installations grew 70% year-over-year in 2015, and we’re sure this will continue in 2016. Across the nation people want solar, and the passion category highlights the states that shine with the most interest in solar. The third category ‘speed’ is important and gets right down to the average growth rate of residential solar interest per state between January and November of 2015. The U.S. experienced tremendous solar energy growth in 2015: 1,361 megawatts (MW) of solar photovoltaics (PV) was installed in the second quarter of 2015 reaching 24.1 gigawatts (GW) of total installed capacity – enough to power 5 million American homes. There was tremendous growth in solar markets across the U.S. in 2015, but, some states had higher growth than others. New Jersey, the Garden State saw the highest average growth, with Louisiana, the Pelican State taking second. The speed category is exciting as it highlights where solar interests are increasing the quickest in the U.S, giving insight into where growth will be seen in 2016. Florida took the crown as the ‘Strongest’ solar state, New Hampshire had the most ‘Passion’ and Hawaii had the highest average growth in 2015. It’s great to win any of these titles, however, winning the top spot in the top ten overall solar states to watch in 2016 is where it’s at. Moving up from second place in last year’s rankings, Florida, The Sunshine State, takes the top spot to watch in 2016 based largely on its strength (1st place) and passion rankings. Washington, The Evergreen State, has a strong hold on second place after ranking in all three top ten categories. Georgia, the Peach State, took third place, just barely edging out South Carolina. Ohio wraps up the top five, followed by North Carolina, Nevada, Utah, Alaska, and Vermont to compose the top ten solar states to watch in 2016. Our rankings are based on market growth and expansions, and homeowner interests whereas Solar Power Rocks rankings are based on political and government policies in each state. We felt it was important to include Solar Power Rocks’ 2016 United States Solar Power Rankings to balance these two very important components. As such, the top 10 states to watch in 2016 that we’ve predicted is a combination of both political willingness, and market expansion based on homeowner interest. The solar industry had a record breaking year in 2015, and we expect this to continue in 2016 with the extension of the ITC. We look forward to tracking our projections to see which states are the big solar players in 2016. The data used in this report was collected and analyzed by SolarLeadFactory, a solar-focused residential lead generation business leveraging online marketing strategies. The analysis which we undertook was based on data segments of comprehensive US-based web traffic we collect. For information on sales, please email sales@solarleadfactory.com.